Mystery Monday - Austrian? Polish? Russian? Ukrainian? Something else? Ethnicity. We often take great pride in the mother country of our ancestors. One of the interesting things about genealogy research is you can uncover that some family history which is has been passed down is untrue or riddled with mistakes. This is a story of one of those instances that makes you to rethink your family origins. I had always been told that my maternal grandmother's family came to the US from Russia. The family name was Gula and it sounded like it could be Russian to me, so I never had any reason to question it. My great-grandfather, George Gula, lived in Scottdale, PA for most of his life. He passes away on May 21, 1967. George died before I was born and evidently my mother and his daughter believed that he had been born in part of Russia. The first records I reviewed to find out his origins were the 1930 US Census. The census records indicated that he was born in Austria. Austria? No one had ever said anything about Austria. In addition, the census records indicated that the language spoken at home was Russian and that he was born abt 1889. Also, it stated that he arrived in 1906. Next, I uncovered a copy of George's obituary. See post June 21,2011. This, too, stated he was born in Austria, but the obituary gave the name of the town of his birth, Wolowitz. Great! His hometown! Perfect! This should be easy. However, there isn't a Wolowitz, Austria. I was aware that country borders in Europe moved around a lot over the last few hundred years, but i didn't know of any period where Russia was a part of Austria. I expected that if I could get a copy of George's naturalization records, that may help be a key piece of the puzzle to his origins. 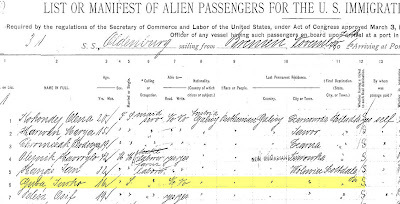 I requested copy of George Gula's naturalization records from Westmoreland County, PA The naturalization records revealed that he was born on March 12, 1889 in the town Wolowiec, Austria. The slight change in spelling of the name of the town made a big difference. 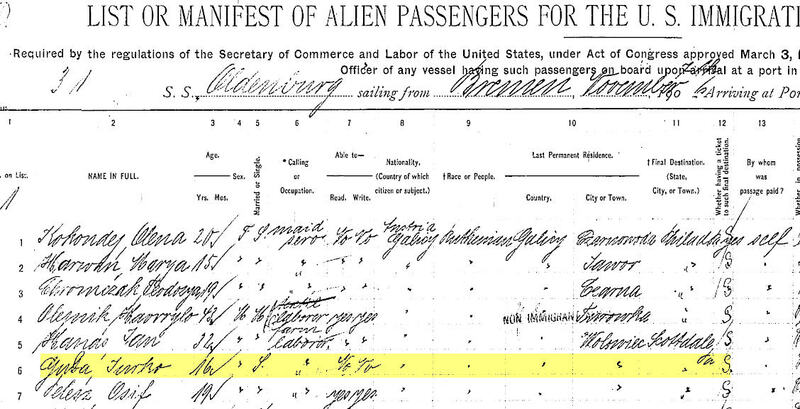 Even more importantly, the naturalization records revealed that George arrived at NYC on the ship the Oldenburg on November 21, 1906. Next, I went to the Ellis Island Immigration records looking for the original passenger list records. This was a jackpot of information. First, I found that George's birth name was "Jewka" Gula and that he was from Austrian Galicia (a region that included part of Poland). Second, it gave his race as "Ruthenian". This was a new one to me and I thought that this might have been an error or another way of referring to Russian ethnicity. Google search of Wolowiec and Austria Galicia revealed that Wolowiec was no longer part of Austria, but was in extreme southern Poland in the Carpathian Mountains. Here is a picture of the Byzantine Catholic church which still stands in Wolowiec, Poland. Does this mean I was Polish? But what was this "Ruthenian" people? Was that a clue? I checked "Ruthenian" and found a Wikipedia entry which stated that essentially Ruthenians were Eastern European Slavic peoples specifically Lithuanian, Ukrainian or Belarussians. When I did some additional searches on Wolowiec and on Ruthenian...I eventually found a great website called the Carpatho-rusyn knowledge base. 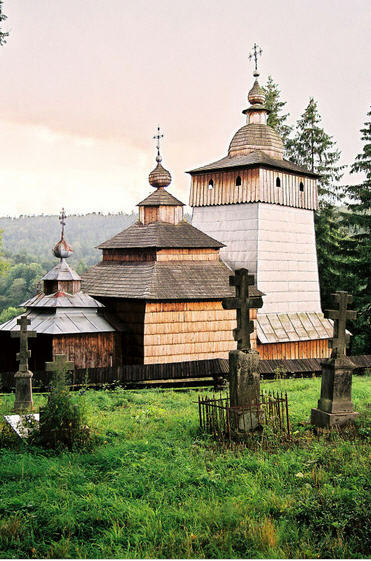 On this website, I discovered that the Greek or Byzantine Catholic residents of Wolowiec were part of an ethnic group called Carpathian Rusyns or just Rusyns. It is interesting to note the Ukraine does not recognize this group and believes they are Ukrainians and not a separate sub-group. Some famous Rusyns include: Andy Warhol (famous painter), Robert Urich (actor), and Tom Ridge (former Governor of Pennsylvania). But, in the end, I found out my Great-grandfather was born in modern day Poland and that he was ethnically a Ukrainian/Rusyn...not Russian. It is amazing how a few weeks of research can result in having you rethink everything you thought you knew about your family origins. My mother's family is all from western Pennsylvania. Unfortunately, there aren't many vital records online for this region. 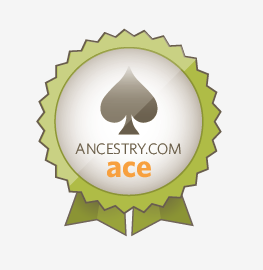 I rely on Ancestry.com as my best source for historical records, but in this case it wasn't helpful. From my own family history, I did know the names of many of my aunts and uncles and great-aunts and great-uncles, but very few spouses. After a lot of searching for marriage records, I fell upon a new resource from Westmoreland County, PA. They have records for since the late 1890's online. Presumably you can contact the county directly with the record number and license number information and receive a copy of the full marriage license application. Not everyone gets along with their mother-in-law. It can be hard to live up to the expectations she had for the spouse of their "princess" or "momma's boy". This can definitely create family tension, conflict and even in some cases divorce. Here is an unusual case that transpired between my distant cousin, Margarita Fuller, her husband and his mother-in-law, Addie Fuller. Margarita Fuller and her husband, Stanley Woodworth, were married in 1898. Stanley Woodworth worked for Margarita's father, Andrew August Fuller, as a clerk at The Bass Point House in Nahant,Massachusetts. Andrew Fuller owned and managed The Bass Point House, which was a popular summer resort. It isn't a huge leap of faith to believe that Stanley expected that he may have had a chance to run the resort one day. To make things even more complex, Stanley and Margarita lived at The Bass Point House with her parents. After being married for 12 years, they did not have any children. This may have put added pressure on the marriage. Not to mention the fact that Stanley worked for his father-in-law could make things even more stressful. In 1910, Marguarta filed for divorce citing "cruel and abusive treatment"
It is likely that the divorce would have had a devastating impact on Stanley Woodworth. Not only does he lose his wife, but it likely meant he lost his job and his home. Stanley took the very unusual step of responding by suing his mother-in-law for "alienation of affection" with his wife. He must have felt that his loving wife had been turned against him by Addie. Of course, we shouldn't discount the fact that Stanley might have been an abusive husband. Up until women won the right to vote in 1920, women were often not well treated by their husbands. Men had little concern of legal ramifications for how they treated their wife and divorce was very rare. The episode has a happy ending for Margarita Fuller Woodworth. She found new love and married Charles Chapman between 1910 and 1920. Maine, then a part of Massachusetts, was not the hotbed of revolution that Boston was, but did have some limited mob actions and riots in reaction to taxation and Tory activity. In many ways Falmouth was seen as a stronghold of loyalists, who continued to profit and trade with England. 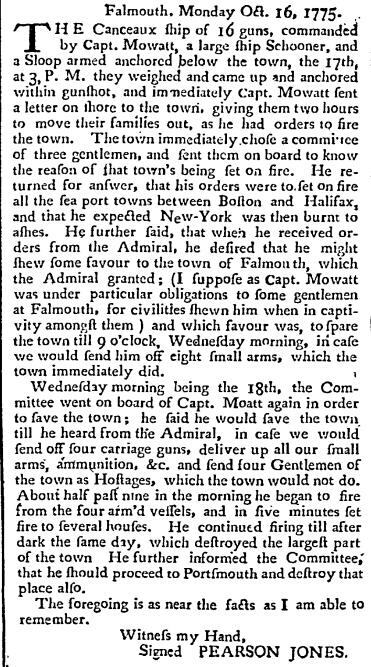 Under orders of British Admiral, Samuel Graves, to burn sea ports from Boston to Halifax, Captain Henry Mowatt, sailed to Falmouth with the specific purpose of burning the town. Here is the recounting of the event by an eye witness, Pearson Jones, which appeared in many colonial papers as a dispatch from General George Washington. The fire destroyed more than three quarters of the city, turning to ashes more than 400 buildings and houses, leaving over 1,000 people without homes with winter coming soon. I am, gentlemen, your obedient and humble servant." While history books have widely ignored the events of the impact of the Burning of Falmouth, it can not be underestimated that the accounts of the unprovoked attack and burning of Falmouth appeared in all the major colonial newspapers and would have raised anger and fear of the despotism of England. According to the book, "The Story-Life of Washington" by Wayne Whipple, it noted that "..the burning of Falmouth enabled every patriot to hate England with out feeling guilty about it, and it even cured Washington of whatever love he may have had for royal rule..."
In many ways, the burning of Falmouth was a pivotal atrocity and indicated that England was capable of similar act of barbarism in any other seaport towns. What is my historical connection to the event of the Burning of Falmouth? My 4th Great-grandfather, John Armstrong, witnessed the event and it had a dramatic impact upon him. It provoked him to volunteer for military service. John Armstrong of Cape Elizabeth, Maine enlisted November 1775 and served until February 26, 1779. He retired as a lieutenant from the Continental Army (I am trying to dig up exploits of the regiments in which her served for future posts). This is the perfect time of the year to remember those patriots who fought and sacrificed to secure the birth of the United States.